This colourful book for kids is split into four main chapters - the ancient world; the medieval world; the modern world; and 20th and 21st centuries. Detailed maps take you on a journey, from early humans and the building of the first cities, to the land of the pharaohs in ancient Egypt and the rise of the Roman Empire. 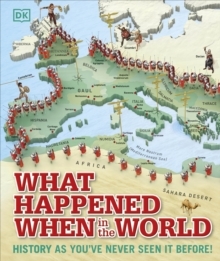 After that, you can march across Europe with the Crusades, battle the Black Death, and understand the impact of major global events such as the American Revolution, World War 2, the Space Age, and the recent rise of China.